Share the post "Gig review: THE DEAD DAISIES – O2 Islington Academy, 19 November 2018"
I’ve come to love the Massive Wagons only relatively recently. This year’s excellent and decent-selling album ‘Full Nelson’ seemed to move the band into different territory. This awakening finally cemented in my dulling brain that Massive Wagons and Monster Truck are different bands… It’s not easy you know. The band ambled on stage and cranked full pelt into the Quo tribute ‘Back to The Stack’ piled high with thumping three-chord shuffles that might be ‘Caroline’ on steroids. The song’s invitation to toast the departed Rick Parfitt went down warmly. A perfect set opener. There was a good Monday night crowd in at the Academy and plenty of MW t-shirts amongst them. Irrepressible front man Baz Mills had emerged wearing a bowler hat and jacket, but his energetic stage moves meant they were soon dispensed with to reveal wild locks, a Public Enemy cut-off and heavily tattooed arms. His distinctive studio voice loses nothing in the chaotic live arena that they generate. No nonsense riffs created an infectious vibe throughout the set. ‘Billy Balloon Head’ is a classic-in-the-making, full of earthy digs at ignorance and intolerance. ‘Fight the System’ followed up with calls to resistance lurking behind the booming riff. But the lyrical content pales beside the energy and vigour of the show, in all honesty. The stage they have to work with is tiny, given that the Dead Daisies’ covered-up drum kit resembled a small gas holder. This doesn’t stop Baz swinging his mike stand around like an offensive weapon, nearly taking out Adam Thistlethwaite on lead guitar to his right and Stevie Holl on rhythm axe to his left. ‘Ratio’ and ‘Hate Me’ also set a full-bodied tempo. A small grumble would be that the lead breaks got a swallowed up in the overall melee early in the set. It didn’t really cut through til ‘Hate Me’ by which time Baz was down in the crowd giving “sweaty northern hugs” to anyone within grabbing distance. The furious, Facebook-rant of ‘China Plates’ followed and then ‘Fee Fi Fo Fum’ to close . The bar had been set very high for The Dead Daisies to follow. MW do not go for a polished show, indeed it is pretty loose at times, but it is absolutely compelling and vital. Good honest hard rock given a classy twist by some very good new songs. Massive Wagons are rumbling your way soon. The Dead Daisies are a different proposition entirely. They don’t like to shirk a dramatic moment – there was even dry ice in the Gents! I kid you not. Rhythm guitarist, David Lowy’s hard rock collective has been busy this year. ‘Burn It Down’ was released in April and they have been on tour pretty much ever since. 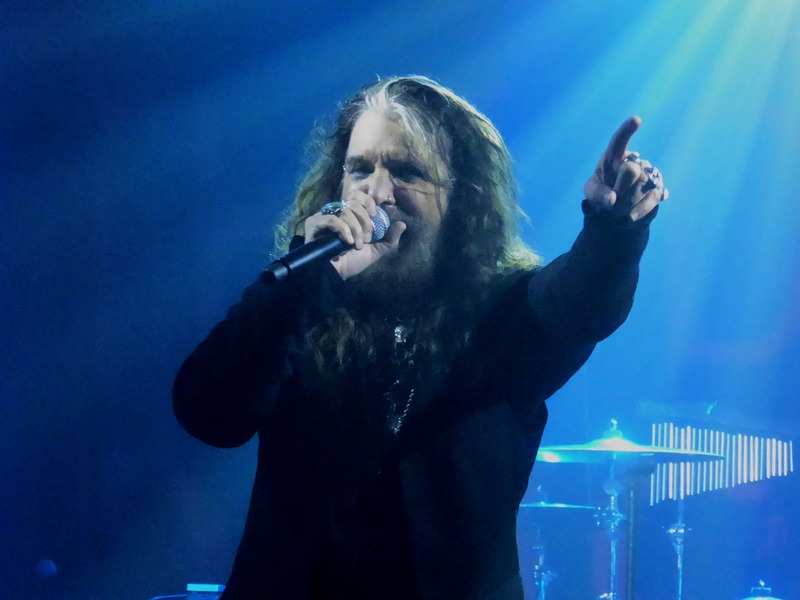 4/5ths of the band rolled up on stage to pump out a grinding rhythm to ‘Resurrected’, leaving frontman John Corabi to enter from stage left in his own sweet time and take the full plaudits. The show provides old school, good value, (slightly) tongue in cheek, proper hard rock for a big fat two hours. Great entertainment. I’m a fan of the Daisies, but their own material is a bit patchy. This might be why they chuck in plenty of covers – six or seven tonight – and break up the set with a good-humoured acoustic section. Of their own material, the opener, ‘Resurrected’ was a departure from the setlist at this venue the previous night and created the right vibe with its biting guitar and massive drum sound. Though those comments could apply to everything outside the acoustic interlude. Where I have a problem is with the lumbering, uninspiring chunks of mid-paced pseudo-anthemic fodder like ’Make Some Noise’ and ‘Rise Up’. Clearly I was in a minority because the Academy crowd was loving it. And it is true that the band get away with weaker tracks because they absolutely nail it on stage. Corabi was an engaging, humorous, relentless front man and he leads his troupe of leather-skinned, blinged-up, tattooed veterans like outcasts from Pirates of the Caribbean. Only Doug Aldrich breaks the mould. He appears age-less and played a sort of Tom the Cabin Boy to Corabi’s Captain Pugwash and the other swarthy buccaneers. Aldrich was in scintillating form. ‘Last Time I Saw the Sun’ had him stage front and centre, concocting his most earnest face for some serious nurdling. ‘All The Same’ had a wonderful guitar passage and ‘Song and a Prayer’ was also a vibrant highlight of the early set, featuring some of Corabi’s best lyrics. The collective element of the band was on show, too. The Slash co-penned ‘Lock & Load’ was wheeled out from 2013’s debut album and bassist Marco Mendoza did a fine job on vocals. Of the covers, The Who’s ‘Join Together’ was absolutely electric and stood out. ‘Fortunate Son’ was also thrilling. It is such a great song and the band have almost made it their power-packed own. I do miss a little subtlety and craft of the CCR original, though. ‘Helter Skelter’ came late in the set and struggled to shake off a lumpen feel for such a dynamic track, and only a searing psychedelic mini-epic from Aldrich saved it. The aforementioned acoustic set gave time for some extended bants with the crowd and the chance for some communal singing. Corabi grabbed an acoustic guitar, Deen Castronovo pulled up the maracas and we had the five troubadours on stools picked out under spotlights at the front of the stage. ‘Set Me Free’ was a little turgid, if I’m honest, but Castronovo put in a fine shift on ‘Maggie May’ with everyone in the hall matching the drummer’s husky delivery. Then David Lowy had a go, with mixed results, on Ringo Starr’s ‘Nothing Comes Easy’. The power was flicked back up to 11 for a home run that featured some blistering work on ‘Long Way to Go’ and ‘Leave Me Alone’. Corabi was again in top form for the extended band introductions and even his cheesy jokes went down well. The intros themselves were another way of cementing a bond with the crowd by playing snippets of classic rock moments. ‘The Boys Are Back in Town’ (Mendoza), ‘Smoke On The Water (Aldrich) and an absolutely riotous ‘Dirty Deeds Done Dirt Cheap’ (Lowry) had everyone singing and grinning. Of the closing numbers, ‘Mexico’ was simply enormous and the final track, ‘Midnight Moses’ featured a riveting bassline that had me wondering what Marco had been up to all night. There is not a shadow of a doubt that the Daisies put in a huge shift here. Even though I might be a bit nit-picky on the strength of some of the songs, there can be no question about this band’s commitment and sheer determination to entertain. Everyone walked out with smiles on their chops. Can there be a better testament? This entry was posted in All Posts, GIG REVIEWS and tagged David Lowy, Deen Castronovo, Doug Aldrich, Full Nelson, gig, John Corabi. Burn It Down, live, Marco Mendoza, Massive Wagons, O2 Islington Academy, review, The Dead Daisies. Bookmark the permalink.